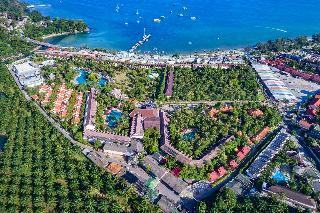 This lifestyle beach hotel is situated in the area of Patong just beside the beach. 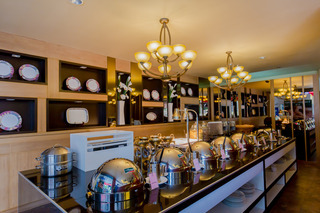 It is within walking distance from the vibrant bar and restaurant area where guests can enjoy traditional Thai dishes. It is 10 minutes from Bang-La Road and only 20 minutes from Phuket. At this hotel guests will be able to enjoy a soothing and peaceful holiday. Relaxation and comfort is waiting for you at this wonderful hotel. 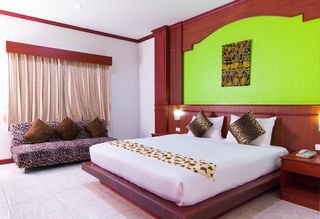 Hotel is located in Phuket, known as an ideal location for those seeking to get away and relax. Phuket offers an abundance of beaches, parks, and forests to explore. The beach is just a hundred meters from the hotel where you can enjoy the warm sun and white sand. Various nightlife and shopping locations in Patong are just 1 km away for all to enjoy. The staff at the hotel will attend to your needs with a warm hospitality and homely atmosphere. Rooms are a perfect for those travelling by themselves or with their families. Hotel offers different facilities and services for all guests to enjoy. You can relax out by the pool and take in the sun or have a relaxing massage. Hotel offers 24 hours reception, outdoor pool, and pool for kids. Staff also offers assistance with local tours and tickets for local activities. Car service is also available at the hotel for those who want to explore Phuket. Hotel also offers a comfortable and convenient airport transfer. Whether you are here for business or leisure, hotel is sure to be the perfect fit for all. 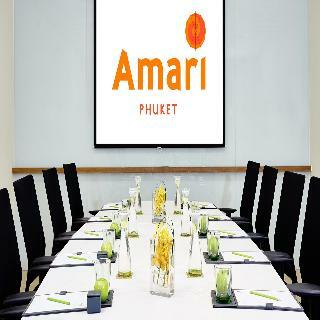 The luxurious Amari Phuket enjoys spectacular view of the Andaman Sea. It boasts 2 outdoor pools, a first-class spa and 2 dining options, Free Wi-Fi. 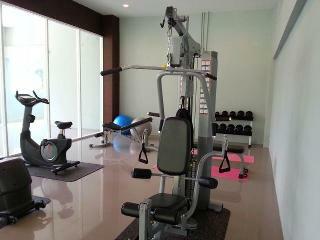 Located in southern Phuket, 1.5 km from Bangla road and jungceylon mall. Bright and airy, rooms come with private balconies and beautiful view. Amenities include a satellite TV, DVD player and tea/coffee making facilities. Breeze Spa features a wide range of beauty treatments, Relaxing massages and therapies can be enjoyed from sea-facing pavilions. The hotel also provides an outdoor spa pool and a fitness centre. La Gritta serves Italian dishes featuring gourmet pizzas, fresh pasta, delectable desserts along with an extensive wine list. Seaside international dinning is available at Rim Talay and the spectacular Jetty Restaurant. Drinks and quick bites are served at both the Rim Talay Pool and Samutr Bars. The family-friendly design hotel offers excellent service in a tranquil and secluded hillside location, with the beach, shops and Phuket's most vibrant night entertainment venues all within walking distance. This new, tropical, boutique hotel is equipped with the latest innovations in travel technology and offers a stylish sanctuary of contemporary Thai hospitality near Patong Beach in Phuket. 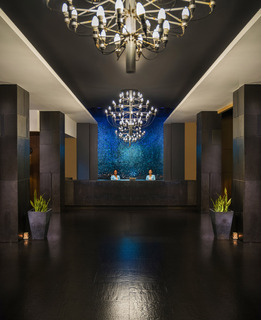 Built in 2010, the 123-room hotel welcomes its guests in a lobby with 24-hour reception and check-out services, a hotel safe and currency exchange facilities. There is also a café, bar and restaurant. Each accommodation unite features an en suite bathroom with shower and a double or king-size bed. Other in-room amenities include Internet access, a safe, minibar and coffee making facilities. There are 2 outdoor swimming pools and a sun terrace. This family-friendly complex is located only 300 m from Patong-Phuket town bus terminal, and approximately 600 m from the entertainment area of Patong. The stylish Thai-style resort is a contemporary development and was recently renovated. It offers 95 rooms in total, spread across 2 floors. In-house facilities available to guests include a 24-hour reception, currency exchange facilities and a message service. High-speed Internet access is provided and there is also an on-site restaurant. All guest rooms, including the bungalows, are surrounded by tropical gardens and come with a balcony or terrace, facing the swimming pool and garden, equipped with a dining table and chairs. 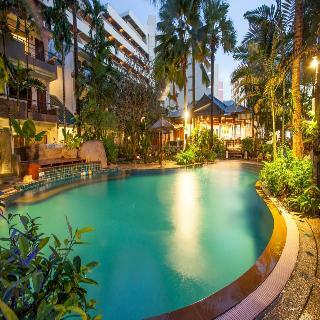 This resort is conveniently located in Patong Beach, surrounded by entertainment spots and shopping centres. The nearest bus station is a 10-minute drive away, Phuket Airport is about 27 km away and Phuket itself is about 55 km away. The resort complex enjoys a magnificent setting surrounded by beautiful scenery. Opened in 2006 and fully air-conditioned, it has a hotel safe, bar and restaurant. Parking facilities, room and laundry services are also available. The standard rooms are built in an embraced natural concept with a private terrace or balcony facing the swimming pool and gardens. All rooms feature individually adjustable air conditioning, a private bathroom with shower and telephone, as well as cable TV and a fully stocked minibar. The resort provides an outdoor swimming pool with children's wading pools, adjoined by a hot tub, sauna room and pool bar. Guests may take advantage of massage treatments and room service. Phuket is the largest island in Thailand. It is very hilly and its highest point is the Mai Tha Sip Song, at 529 metres. The west coast boasts some beautiful sandy beaches. Patong is the most popular one, although Karon and Kata, among others, also attract a great many visitors. These white sand beaches and the clear waters of the sea make this the perfect place for all kinds of water sports such as sea kayaking, surfing, snorkelling, sailing, jet skiing, parasailing, fishing and, of course, diving to see the coral reefs and the amazing seabed, full of life. Don't miss the sunset from the southernmost point of the island, Laem Promthep; it is truly spectacular. Patong is the place to go if you want to go shopping or you fancy some nightlife, since here there is a wide array of restaurants, bars and nightclubs, especially around Bangla Road. The range of hotels and bungalows is also very good. Some of Phuket's most visited monuments include the Wat Chalong temple and the Big Buddha. Have a stroll through the old part and take in Phuket's colonial architecture or visit one of the museums or exhibition centres. Your holiday in Phuket will be unforgettable.